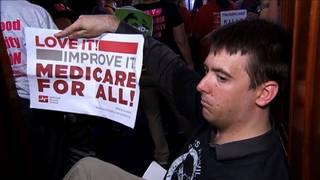 David Cay Johnston: Trump is “Appallingly Ignorant” on Healthcare & Puts Greed Above Human Lives | Democracy Now! Pulitzer Prize-winning investigative reporter and founder of DCReport.org. "Is This Trump's Vision for America? In His Budget, You Can See a Country That Looks Like a Police State." The Congressional Budget Office has warned that 32 million Americans would become uninsured over the next decade if Obamacare is repealed without an alternative in place. Seventeen million would become uninsured next year alone. The analysis also found the cost of a medical insurance policy would increase 25 percent next year and double by 2026. We speak with David Cay Johnston, Pulitzer Prize-winning investigative reporter and founder of DCReport.org. NERMEEN SHAIKH: The Republican-controlled House Budget Committee approved its 2018 budget resolution on Wednesday. It would slash welfare spending, gut financial regulations and rewrite the tax code to favor the wealthy. The budget would also slash funding for Medicaid and Medicare over the next decade. In addition, the Republican budget would add another $30 billion to Trump’s record-setting $668 billion request for Pentagon spending. The resolution passed along party lines, but the budget faces opposition from both moderate and conservative Republicans. This is Budget Committee Chair Diane Black. REP. DIANE BLACK: Our budget this year is set to increase the spending for our military, because we know that the military has been decimated over the last eight years. And with all of the additional threats that we have around the world, we need to make sure that our military is ready and that we’re defending—we’re making sure that our men and women that are serving have what they need to serve. We are looking at this being a vehicle for doing tax reform, which is obviously one of the things that all Americans are looking forward to—a fairer, simpler and flatter tax code. AMY GOODMAN: Meanwhile, the Congressional Budget Office has warned 32 million Americans will become uninsured over the next decade if Obamacare is repealed without an alternative in place. Seventeen million would become uninsured next year. The analysis also found the cost of a medical insurance policy would increase 25 percent next year and double by 2026. The Republican-controlled Senate has twice failed to pass the healthcare bill. To talk about the budget, healthcare and more, we’re joined now by David Cay Johnston, Pulitzer Prize-winning investigative reporter, previously with The New York Times, now founder and editor of DCReport.org. His most recent piece is headlined, “Is This Trump’s Vision for America? In His Budget, You Can See a Country That Looks Like a Police State.” Johnston’s biography of Donald Trump is titled The Making of Donald Trump. Well, welcome back to Democracy Now!, David Cay Johnston. Why don’t we begin with healthcare? So much changed in just a day, from it looking like the Senate was just not going to deal with this, the Republican bill collapsed, President Trump bringing them to a White House lunch—the senators—and demanding that they pass at least repeal before they recess, but hopefully a replacement, as well. Can you talk about these latest developments, not to mention now the latest news, John McCain, so essential to these votes, the Republican senator from Arizona, being diagnosed with malignant cancer? DAVID CAY JOHNSTON: Yeah, John McCain has been a real conscience in the Senate and a powerful force against all sorts of corrupting influences, despite early in his career his own difficulties with not being careful about his relationship to donors. He learned his lesson, though, and got better. What you’re seeing the Republicans do on healthcare is make it worse. There’s not a single proposal in any of the various plans the Republicans have put up, the ones Donald Trump calls “beautiful” and “terrific,” that would give more people healthcare or better healthcare or lower the costs. And that’s because the Republicans really don’t have a plan. Obamacare, at its heart, is a Republican idea: Make everyone buy insurance, so there are no free riders and everyone shares in the cost, and subsidize those people who have incomes too small to afford insurance. Now, to put this in perspective, Amy, if we had in America the French or German universal healthcare systems, where everyone is covered, it would save an amount of money equal to all the income taxes paid by everyone who makes less than $500,000 a year in America—actually, about $550,000. That’s over 99 percent of the American public. We have a horribly inefficient sick care system that routinely kills people through lack of care. And the Republicans’ goal here is to fulfill their promise to their supporters that they were going to stop the provision of publicly subsidized or financed healthcare for poor people, and they were going to address what they’ve clearly identified as the major economic problem in America: The rich don’t have nearly enough, they need to get more to the rich, and the way to do that is you take it from the sick, the disabled, the elderly and children. DAVID CAY JOHNSTON: And at least they’re following through on their promise. AMY GOODMAN: I wanted to bring up what President Trump said yesterday during the lunch with Senate Republicans. PRESIDENT DONALD TRUMP: We have no Democrat help. They’re obstructionists. That’s all they’re good at, is obstruction. They have no ideas. They’ve gone so far left, they’re looking for single payer. That’s what they want. But single payer will bankrupt our country, because it’s more than we take in, for just healthcare. So single payer is never going to work. But that’s what they’d like to do. They have no idea what the consequence will be. And it will be horrible, horrible healthcare, where you wait on line for weeks to even see a doctor. AMY GOODMAN: —because, in fact, he hasn’t always referred to it in this way. David Cay Johnston, you’ve spoken to him over the decades. Can you talk about the position he’s staking out now versus what he’s told you? DAVID CAY JOHNSTON: Oh, yes. Well, in the past, Donald said to me, when I asked him once about healthcare, “It should be just like roads: When you need them, you use them.” And he was, for a long time, a proponent of single payer. And the ideas that he’s putting forward about single payer are absurd. People in France see doctors more quickly than in the U.S. They have better health status. And longevity is increasing in the other modern countries of the world that have universal healthcare faster than America. If Portugal, whose median income is half that of America, can afford universal healthcare, with promptly examined—promptly being given access to doctors, how can America not afford it? This is absurd. Remember, Donald Trump’s the guy who made all these grandiose promises—he’s an advertising and entertainment sort of person—and, when he got in office, made the astonishing statement, “Who knew healthcare was so complicated?” Trump doesn’t know anything. He is appallingly ignorant on all sorts of issues, and healthcare is one of the leading issues. But has he proposed anything? What did Trump say? “I’m sitting here with my pen in hand.” That is the political definition of passive-aggressive behavior. NERMEEN SHAIKH: David, I want to go, before we move on to the budget, about something that you wrote about in your book, namely, that during a dispute over their father’s will around—this is around the year 2000, Trump cut off benefits from the family health plan that were paying for the medical care of his nephew’s extremely ill son. So could you talk about that incident? DAVID CAY JOHNSTON: Yes. When Fred Trump died, there were five children in the family. An when the will was read, the heirs of Fred Trump Jr., who had already died, before his father, discovered they had effectively been cut out of the will. Surprise, surprise, they went to court and complained. The Trump Organization, which, like many family businesses, provides healthcare to everybody in the family, had been paying all the bills of young William, who, as soon as he was born, a couple of days after Fred Trump’s funeral, developed enormous medical problems, that have continued now throughout his life. Donald Trump immediately cut off healthcare. And when he was asked about this by Heidi Evans of the New York Daily News, he made no apologies. You know, “Well, what else could I do?” he said, in effect. “I don’t like people who sue my father’s estate.” This is a man who is so lacking in compassion or concern for anyone else, even his own blood, that he would put the life of a sickly infant in jeopardy in order to have more money. You know, greed is a sin. And Donald Trump is greed on steroids.